Cheyenne Nicole Roby, 19, entered into rest January 20, 2019 in Grovetown, Georgia, she is the daughter of Travis & Shannon Amos Roby from Harlem, Georgia. Born in Springfield, MO on September 1, 1999 and has lived in Harlem since 2014. She was a student at GMC and was getting ready to start at Valdosta State University. Additional survivors include her sisters Isabella Roby and April Spencer, maternal grand parents Edward & Rita Sommer, paternal grand mother Rebecca Roby. 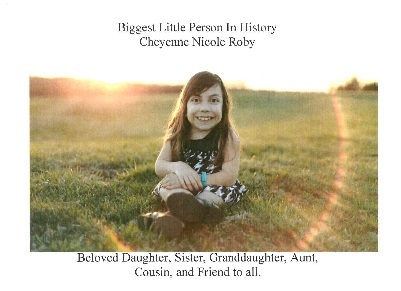 A Celebration of Cheyenne's life will be held on Sunday, January 27, 2019 at Georgia Military College on Davis Road in Martinez.